Fresh Pears, Crisp Apples, Juicy Fresh Oranges. Presented in a stylish tailored gift hamper. The fresh fruit and Godiva chocolate arrangement that I sent as a get well pick me up did just the thing. I was told that not only was it beautiful but the taste was excellent. The recipient was thrilled. I couldn%u2019t be happier with my choice. I sent this gift to my daughter when she was recovering from an illness. It was perfect! Would definitely use again for any occasion. My friend up North just loved her gift basket. Raves that the fruit was fresh and delicious and chocolate absolutely yummy. I discovered this site on accident and am very thankful! This Gift Basket is a lovely way to say 'THANK YOU'; the people I sent it to absolutely LOVED it...which made me very happy. I sent this to our veterinarian's office as a thank-you gift. Our vet called to say it was a most gorgeous basket of goodies which was very much appreciated by both the fruit lovers and chocolate lovers in the office. This is the second time I've used Gift Tree, and both times got RAVE reviews on the gifts. I love the very wide selection, and I think that the prices, for the gorgeous, delicious baskets, is reasonable. I will continue to use and have recommended it to others. Bought this basket for a coworker recovering from surgery. She's a crafter so not only was the fruit and chocolate a nice surprise, the basket will be used for her quilting supplies. This is the second time I've ordered this basket and both times it was delivered on time, the fruit was perfect and the recipients loved it. Great value - I highly recommend it. The gift arrived on time and in good condition. He enjoyed the fresh fruit and candy. Thank you. 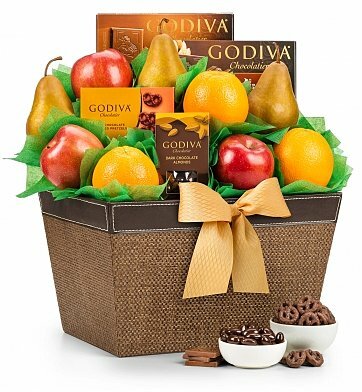 The fruit and Godiva gift basket was a surprise gift for a friend and she said it was quite lovely! I'm pleased it reached my friend in a timely manner and in great condition! Thanks! Didn%u2019t know what to expect because I had never order from them. Read reviews so though I would give it try. I was very pleased and the gift basket was beautiful and very much appreciated.Will definitely use ya again. I had to remember how to arrange the items in the basket so that it had a nice presentation. The recipient was upset that the basket was left on the front porch in the hot sun. Thank God we were able to retrieve it before all the chocolate melted. All of the fruit and candy were fresh and the presentation was excellent. The recipient was very pleased. I will definitely order from GiftTree again in the future. Recipients of the ordered gifts were very pleased with freshness of the fruit and wine selection. Will use Gift Tree again. All items included are first class and fresh. I received a basket as a gift and it was so beautiful and delicious, that I also sent one as a gift! The recipient of the gift basket was just as happy as I was!! We only saw thr photo, but apparently chose something special. Our client phoned with high praise for the entire presentation, inlcuding the basket\ Thank u for making us look good. Excellent products , quick shipping . will shop again . It was a gift to my mother-in-law for Christmas & she said it was beautiful! Satisfied that she loved it. She lives in MN. I sent this to a co-worker as a gift and she loved it! I sent this gift to my co-workers and not only did they really love it, I loved it. The entire presentation was high class (love the scissors, nice touch). The basket is high quality and sharp looking. The fruit very good and the Godiva Chocolates delicious! Ordered on the 9th and it was delivered on the 12th. This is a beautiful and classy basket and I will order again. My co-workers and I sent this beautiful basket to our manager for the holidays. She was so surprised and raved about the presentation and the delicious chocolates and fruit. A pair of scissors was even included so she could cut the ribbon to open the contents of the basket! Gift Tree - You guys think of everything! Thank you!! Sent Christmas Fresh Fruit and Godiva Chocolates baskets to 8 clients and everyone raved about it! Thank you Gift Tree for providing a great product for a reasonable price. Basket was stunning and she loved it! The fruit was very fresh and the pears were excellent. Will shop your store again ,thanks! This was just the perfect thought for showing a friend some support during a difficult time. It arrived as scheduled...beautifully presented & everything was fresh !! Thank you will order again. The basket arrived beautifully and the recipient said it was great and the fruit was incredible. Also the basket was beautiful. We ordered this for my Mom's Birthday and she loved it. She was confused that there were scissors included, but she loved them too. Thanks again for getting it there on time. I ordered this basket for friends going through a rough time. They loved it and said they had never seen such a nice fruit basket. I will use GiftTree again. My aunt and her family were very impressed with the presentation and selection. Fruit was delicious!!! This basket of fruit and chocolates was a beautiful gift. The fruit was large and fresh and the Godiva chocolates were delicious. Our Dear Friends had gifted us with a 2 bedroom suite for our 24th Anniversary in National Harbor for the weekend. We wanted to show our appreciation since they wouldn't accept any monies so we sent them this basket and she said they loved it! I wish we were there to see when they arrived home but we know they were excited. I didn't ask how it was delivered, but hope it was presented as in the photo. I'm looking forward to sending more baskets. Usually I read reviews instead of write one, but I just had to for the curious purchaser out there like myself. I bought this basket, which was delivered to my Mom for her birthday. She is a super picky individual, but absolutely LOVED it!! Said the basket was beautiful (great keepsake) and the orange she ate was so sweet. Wish I could have been with her to see for myself. But, she ranted and raved about it on the phone, so based on her reaction, I knew it was a true winner and would certainly order from GiftTree again. I sent this to a friend and they were so pleased with the presentation and the quality of the contents and packaging. Would definitely use GiftTree again! was fresh ripe and delicious. The chocolates was a yummy bonus. I would highly recommend GiftTree. It was a delicious gift. The fruit was fresh, very juicy pears, and crisp apples. The added bonus was my favorite chocolate a delightful holiday treat. I was so impressed I sent an identical one for a family holiday gift. I also liked the container and it already holds my magazines. I plan to use Gift Tree as needed. I was late ordering a Christmas gift, but my basket was delivered on Christmas Eve. The recipient was pleased with the selection of fruit and chocolates. I have used many online gift basket sites in the past and this was my first time using Gift Tree. The recipient said this was the best basket she has ever received from me. Fruit was outstanding and the Godiva treats were yummy. I would send this out again. Heard from one of the families and they raved about their gift. I thought the customer service was great as was the time frame and delivery. I will definitely use Gift Tree again!!! A great service! Lots to choose from, easy website, great communication and a beautiful gift. Thank you for making my Christmas present shopping so successful. Would highly recommend. Sent this to my daughter as a "pick me up" She is currently going through chemotherapy. She loved it!!! Fruit was so fresh! I was told everything was good. The gift box sent to a business colleague arrived on time and was greatly appreciated. I didn't of course see or sample it myself but I trust that the enthusiasm was sincere. The chocolates went first! Well received. This was my first experience with GiftTree and I was pleasantly surprised at how smoothly the entire transaction went. I purchased the Fresh Fruit and Godiva Chocolates basket two days before my Aunt's birthday. It arrived on time as promised and she loved it! I'm sure I'll be using this company again. Thank you for delivering the gift we purchased in a very timely manner. Received a beautiful "Thank you" from the person that I sent this basket to. He said it was just a "lovely basket". Great gift to send someone as a day brightner! It even came with a little scissors to cut the decorative ribbon and cellophane off! How cute is that! My Husband spent his 40th birthday in a hotel, away on business. I didn't want his birthday to go unnoticed. This was the perfect "happy" for his day. It made it on time and looked great. I would order from GiftTree anytime I needed to send special love. According to recipient - basket was a "super nice gift"
Purchased this for my husband for Valentine's Day. He loved the chocolate items and said the fruit was delicious. It also came with a cute set of complimentary scissors to unwrap the product. Very happy with this purchase and the price was very reasonable. Beautiful, and right on time as expected. I got this basket for my daughter and her new husband for their hotel room the day of the wedding. They were very happy with the basket. I would highly recommend!! very impressed with gift and timely delivery. Person who received the gift really liked it. A well received gift, artistically designed, and delicious! This was a Christmas gift for an out of town family member. They said the gift was beautiful. The only issue was the box was left on their front porch. We bought this basket for my aunt. She loved it. She started eating the chocolate right away. Would recommend and purchase again. The couple who received the beautiful fruit and chocolates gift called immediately to say what a wonderful gift it was. Especially the chocolates!! It's always a challenge to find good, reliable companies for holiday gift giving. The basket was well received with a nice mix of fresh fruit and high quality candy, and it was delivered in plenty of time for Christmas. Kudos for a job well done! How do you stand out from the typical mundane Holiday gift you send to a special client, or business partner? You know you want to make an impression, but you don't want to seem too ostentatious. You also want to strike a balance between healthy and give me the chocolate, share the calorie type of love. This is the basket for you! With a healthy dose of fresh fruit and high quality Godiva chocolates, this basket will outshine any and all. We've received many a grateful messages from our clients who've received this great basket. My Mom called the minute she received the fruit & chocolate basket... She said she absolutely loves it! Thank you... I will definitely use your company again. First time customer- highy pleased! This gift was my first purchase from GiftTree and I will probably use you again. The recepient was more than pleased, it arrived intact and timely. "Great product and delicious too!" was reported by my aunt! This was a gift to someone in the hospital. She and her husband both commented that it was wonderful! The gift was delivered as promised! The receivers of the gift absolutely loved it. It made their day considering the circumstances (sympathy gift). I send this to a friend who lost her mother. Her family loved it and enjoyed the fruit and chocolates. The receiver of the basket was overjoyed and happy. Was told by recipient the fruit was very good. Because of the recipient's location no local vendor would deliver so we had to have it shipped. It arrived on time and the fruit was fresh. He was very pleased as were we. Though it was sent as a gift (I didn't see it in person) I received a thank-you note in which the recipient described the basket and how much she enjoyed the products within. She loved it and was very touched when it arrived. Loved the gift. They said fruit was great & Godiva was so special. I will use GiftTree again. My friends received and called right away. They said where did you get this! They loved Godiva chocolates and the detail of basket. Presentation the thought of scissors to open up basket was really appreciated by my friends. Will recommend to anyone Thank You. I sent this as a birthday gift. My friend said it was a combination of healthy and happy! Was looking for something special to send to my Friend too cheer her up as she recovers from an operation and I sure did find it. She was so impressed and loved everything about this Basket and what was in it. Thanks soooo much it is a thrill too make someone Happy. I sent this to my daughter as a surprise and she loved it. The basket was great. She said the fruit was fresh and delicious and she loved the GODIVA chocolate! I ordered a gift for my other daughter! The recipient greatly enjoyed the basket! People receiving this called to say what a beautiful arrangement. Te basket was great and the recipient was very pleased. Bought the fruit and Godiva basket for my son and daughter in law and three children in Katy, Texas. They said that the basket was beautifully put to- gether and the pears in particular were fantastic. Ofcourse Godiva is the best chocolate ever. The recipient was delighted with the basket, the only problem was that he never received the note indicating who sent it and why. He found out it was his new employer after HR asked him what he thought of it. was the comment from my parents who I sent this to for their wedding anniversary! They said it was a stunning presentation, the fruit (and chocolate) very fresh and my mom's thinking how to re-use the basket it's empty because it's too pretty to discard. Great gift, great price and on-time delivery, I'd definitely order from this company again, thank you!! The fruit was fresh and the combination with chocolate was a big hit ! I only saw the picture when I ordered it, but I figured I can't lose with anything from Godiva. I was right !! - and it was delivered when promised in good condition. I got raves about this basket which was an anniversary gift. They said the fruit was delicious and the Godiva chocolates were fabulous. Will definitely use GiftTree.com again. My mom loved her unexpected treat. Thanks for this wonderful product!! This basket is very nice. The fruit was fresh and everything that was in the picture was delivered exactly. My only slight disappointment was that the basket was obviously packed for shipping, for which I appreciate and understand as it was packed very carefully and well. The fruit was carefully packed on top but the candy treats were stored deep down underneath the basket packing material. I had to rearrange the basket to look nice and tidy in order to be able to present it to the giftee. I would definitely order from Gift Tree again. I felt their prices were fair for what was delivered. My aunt & uncle loved this basket I sent for their 70th Wedding Anniversary. I would definitely use this company again. The fruit and Godiva chocolates were received with such enthusiasm. It was a Get Well gift and the receipient thought it was the most beautiful get well she received. She was in such good spirits. Thank you Gift Tree. Sent to my son and was very well received. Very nicely wrapped and shipped. Fruit was excellent and wonderful selection of Godiva chocolates! Thank you for your consistently excellent service and and products. My friend who received this called immediately to thank me for the beautiful basket with lovely fruit and chocolate. This was my first purchase from GiftTree.com but I will certainly use this site again. Even though this was delayed several days in the Atlanta ice event everything arrived in good shape! My sister loved it ! My daughter-in-law loved the basket. She couldn't believe all the chocolate goodies. The arrangement was out standing. The basket is beautiful the fruit wonderful. It was worth the money. My sister-n-law was recently diagnosed with leukemia. When she received this gift basket at the hospital 10 hours away from me, she said it lifted her spirits at a perfect time. I'm glad I was able to brighten her day. Personalized Ribbon was a Hit! I sent this basket to my mother-in-law after she had ACL surgery. She said the fruit was extremely good and (of course) the chocolate was delicious. She was most impressed by the personalized ribbon...that was a very nice touch! I definitely recommend this gift. I sent the basket as a "Thank You" The recipient was very impressed. I was impressed with your personal service. The item I sent was a gift and my sister, who received it, was overwhelmed with the presentation, the contents, and just everything about it; even the ribbon with her name on it. I look forward to using your services again ... perhaps even to give myself a gift! Thank you so much for being reliable. I was searching for a thoughtful Condolence gift, when i came across your site. I was pleased at the way you responded to my request. I was able to pick out a delightful basket for my Neice. She had just lost her husband to a fatal heart attack, suddenly. I sent this basket to my daughter as she was recuperating from minor surgery. She was very excited and very pleased with the contents of the gift basket. We are both big Godiva chocolate fans so this was a perfect fit for her. You do have many gift options which makes it very easy to find something for everyone. I sent this gift basket to my mom, who was in the hospital. She absolutely loved the basket! The fruit was a very generous size. everything in basket was great. I will order from Gift Tree again. I recieved this, as a corp gift. All things were good. Exceptional fruit! This was a Christmas gift to my son's in-laws and it was so well received I will certainly use your services again. They called to tell me how thrilled they were with this unexpected gift. I could not be happier with my choice. Delivery was to the day, perfect. This gift basket was sent to our son who said the fruit is delicious. Good mix of items. My friend truly appreciated the presentation, it was a great pick me up after surgery. If you want to send something naughty and nice, this is the one. I only heard from a friend how beautiful the package was when delivered. Perfect gift for home. My sister loved the fruit, and her hubby the chocolates. the variety in the handsome case that it was delivered in. It was very happily received!!!!! Thank you! I did not personally see the gift because it was sent out of state. However, the recipient of the gift basket was pleased, especially with the size of the fruit. It was impressive! I got it as a Mother's Day present thinking it was a good combination of sweets and fruit. My mom especially mentioned how delicious the pears were and the espresso cake. She also was impressed with the basket as it was something you could keep for other uses. Just wish the shipping charges were a little less, really adds to the overall price and makes you often have to pick a "lesser" basket due to shipping charges. I sent this basket to a very good client on behalf of our company. The day that it was delivered we received a phone call from this gentleman saying that it was absolutely the most delicious and beautiful basket that he had ever gotten. He was quite impressed with the quality of items in the package as well as the packaging itself. We will definitely be using your services again! My father had surgery, wanted to get a get well basket. They said it was the nicest basket they have received by me, I have used other companies. They said the fruit was very good. I sent this to my sister and she said it was beautifully wrapped and everything was delicious! The gift was for a funeral. The family is diabetic and the fresh fruit made it presentable and editable for them. The chest could be used for the cards they received. Thank you! My neighbours were very happy with the gift and its presentation. I sent this as a Thank You gift to a dear friend of mine. He told me that it was a very nice assortment and that the fruit was wonderful! I purchased this gift for a very special friend in Boston and it was confirmed that the gift was well presented and put together and was enjoyed to the max. I would recommend this gift as one that can be used for any occasion. All of her suite mates were able to enjoy her gift and all said the fruit was awesome and you can't go wrong with chocolate ! Our client loved the gift basket! We recieved this gift while we were out of town. Our mail sitter placed it in the garage [average temp of 40 degrees]. When we opened the package on return, one pear had to be tossed - the rest of the basket was great. We heard from the recipient of this basket - they were thrilled! Said it was "the most awesome gift", and they "really loved it." Thank you for for providing an alternative to the cute, but all junk food type of baskets! We gave this basket as a gift to a friend and their family for the holidays and New Year. They really loved it. It was delivered earlier than predicted which was great since it arrived before Christmas. Great comments from the recipient. Great service and product as usual. I have always recommended GiftTree, especially when you need to send something out of town. I was very pleased that the gift was delivered in a timely manner. In my opinion it was a good value for the cost. This was sent to family in another state so I cannot comment on the contents. Friends were very pleased with not only the contents in the basket, but the presentation as well. Loved the stylish basket and the custom red ribbon. Prompt delivery and excellent service. We rec'd this basket at Christmas time, amazing fruit, great candy and love the basket for using afterwards. Very happy with this gift! Gift Tree was perfect in delivering what they said they would on time to the right person. Unlike other Companies, like Harry and David, these products delighted my Aunt and helped make Christmas better for her. Thank you! The recipients of this wonderful basket were so happy! I'll be using GiftTree all the time! Wow, the fruit is very beautiful and largely presented in an exquisite way. Gave as a gift to our daughter ..she Loved it!! Nice selection. Huge, beautiful, fresh fruit ! My mom absolutely loved it ! Surprised my long distance friend with this basket and she loved it. The fruits were great and you can't go wrong with Godiva chocolates! What a beautiful way to say "thank you" to a loved one. This gift basket was perfect!!! They loved it and I loved sending it... Thanks! I sent this to family members for Christmas and they thought it was a great gift. Lots of good fruit and delicious chocolate. The patient was very suprised and very pleased. Was in awe of how beautifully and well designed the basket was. The gift was nicely packaged and the fruits looked firm and fresh. The only negative note was that the Chocolate packages are smaller than they seem online, but overall a nice gift for the price.